Busloads of elders commute daily to the casinos. For some, it is harmless fun; for others, it is an invitation for trouble. For many decades, the stereotypical concept of what a gambler looked like has been dominated by images culled from movies and television: the swaggering tough guy in a tuxedo at the blackjack table, the middle-aged man with a cigar in his mouth at the racetrack. As gambling has become more accessible and acceptable in our culture, our awareness of who gamblers really are has also broadened to include young and old alike. A 2008 study conducted at Wayne State University examining the motivations among older adults for participating in casino gambling reveals that they gamble for both extrinsic and intrinsic reasons. While extrinsic reasons include winning money and supplementing income, intrinsic reasons include entertainment, being around other people, distraction from everyday problems such as loneliness and boredom, and escaping feelings of grief and loss associated with the death of a loved one or close friend. People are more likely to develop a gambling problem when they’re coping with major life changes or losses. The sudden social isolation that can come with retirement, the increased awareness of physical limitations that accompany aging, and the grief after the death of loved ones constitutes an overwhelming number of difficult life transitions that make older adults particularly vulnerable to developing gambling problems. In addition, many older adults may hide their gambling problem due to shame and social stigma, while reduced contact with friends, family, and coworkers can make the signs of problem gambling hard to spot, creating the ingredients for a formidable issue that social workers working with elders must address. Casinos: The New Senior Centers? Fayetta Martin, MLS, MSW, DL, is an assistant professor at Wayne State University whose current research focuses on women’s gambling behavior and treatment barriers for older women with disabilities. She is also interested in older women with and without disabilities who gamble and how gambling addiction is associated with other mental health and substance use disorders among older Americans. Martin first became interested in problem gambling among older adults in 2004 during her postdoctoral work, which was funded by the National Institute on Drug Abuse at the George Warren Brown School of Social Work at Washington University in St. Louis. What surprised Martin was not merely how many older adults have an addictive relationship with gambling but the extent to which the gambling industry appeared to enable the problem. Of course, casinos are not the only businesses that make a conscious effort to market gambling to elders. Today, older adults can find plentiful opportunities to gamble in senior centers and retirement homes where bingo nights and poker clubs are often part of standard activities. While gambling’s temptation can have a powerful effect, gambling alone doesn’t draw older adults to the casinos; as with other addictive behaviors, the social experience can exert an equally strong attraction. In some ways, the risks of problem gambling for older adults are the same as those faced by younger gamblers—a sudden, devastating loss of financial security and accompanying legal troubles. But older adults with gambling problems also have unique risks. Reduced cognitive capacity among some elders can make it difficult for them to make sound decisions. Also, older adults living on a fixed income with limited savings can’t necessarily afford the financial drain of a gambling disorder. In a recently published study, Nower and her colleagues found that older adults were most likely to ban themselves from casinos because of their fear of suicide. The ability of mental health professionals to diagnose and treat any behavioral problem has always been affected (and often limited) by the current definition of the problem. This is particularly true of addictive behaviors, and gambling is no exception. Like other addictive behaviors, such as alcohol and drug addiction, gambling has historically been thought of as a character flaw signifying a lack of moral strength or willpower; in other words, it’s something that only “bad” or “weak” people do. Today, problem gambling is still identified by terminology that came in use in 1980: “pathological gambling.” According to the DSM-IV-TR, there are 10 criteria for pathological gambling, including a preoccupation with gambling, the need to gamble with increasing amounts of money to achieve the desired excitement, lying to others to conceal the extent of the involvement with gambling, and committing illegal acts such as forgery, theft, or embezzlement to finance gambling. Five out of the 10 criteria are required for a pathological gambling diagnosis. Martin believes that this current definition of pathological gambling has serious drawbacks. “The quantitative framework of DSM-IV diagnosis requires that people be separated into two groups—either pathological gamblers or nonpathological gamblers,” says Martin. While this type of diagnosis is clearly defined and allows clinicians to communicate with one another and make treatment outcome comparisons across cases, Martin believes it also excludes a lot of information. According to James Loree, LMSW, ACSW, CAAC, of the Center for Addiction and Relationship Recovery in Okemos, MI, there are many negative consequences of the current definition. “The fact that pathological gambling is located in the DSM-IV as an impulse control disorder seems to undermine the severity of the addiction, the need for valid recognition and accurate reimbursement by insurance companies, and deliberate and proactive diagnosis by clinicians,” he says. According to Martin, gambling should be identified as a problem when it disrupts, damages, or limits a person’s life. Signs of problem gambling that Martin points out for inclusion are spending more money on gambling than intended; feeling bad, sad, or guilty about gambling; not having enough money for food, rent, or bills; being unable to account for blocks of time; experiencing social withdrawal; and experiencing anxiety or depression. While these signs of problem gambling apply to all age groups, they may be more difficult to identify in older adults. Older adults may try to hide or deny a gambling problem, they may feel hopeless or ashamed about the situation, or they may be unaware that help is available. In addition, because older adults tend to have less contact with friends and family, gambling-related problems may go unnoticed. Martin advises that social workers use an indirect, nonconfrontational approach when attempting to determine when an older client has a gambling problem. Social workers should also be aware of the possibility of problem gambling in whatever professional setting they find themselves in, including those involving older adults. Existing treatments for problem gamblers largely follow a uniform cognitive behavioral therapy model that, according to many in the field, does not take into account particular differences between varying groups of people—and older adults are no exception. While social workers are commonly trained to identify substance abuse, depression, anxiety, and other concerns, problem gambling is not an issue often addressed in social work education. Nower agrees: “Social workers are not being trained to identify this problem at all. There are only two universities in the country that offer education in problem gambling. Both Rutgers and the University of Pittsburgh have programs to train counselors in problem gambling.” Of those two, only Rutgers has problem gambling as an official part of its curriculum. 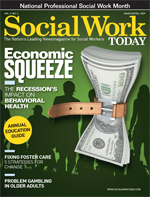 Given that the older adult population is poised to undergo unprecedented growth, social workers can expect to encounter problem gambling among their older clients with increasing frequency. How then should social workers best prepare themselves to deal with this issue? • The National Opinion Research Center DSM Screen for Gambling Problems is widely used by clinicians to demonstrate a client showing problem gambling as evidenced by a score of 3 or 4 and pathological gambling with a score of 5 or more. • The South Oaks Gambling Screen is a legally valid instrument that asks more specific questions than the National Opinion Research Center DSM Screen, yet it is still relatively brief. • The DSM-IV-TR lists 10 criteria to diagnose pathological gambling (five of which must be met for the diagnosis) and is coded as 312.31 under the Impulse Control section; currently, no DSM-IV diagnosis for problem gambling exists. • Finally, the Lie-Bet tool is a two-question screen that any health professional can incorporate into an assessment or conversation with a client to reveal if a more comprehensive gambling assessment is warranted. PDF versions of the above screening tools are available on the National Problem Gambling Awareness Web site at www.npgaw.org/tools/screeningtools.asp.